B&G HALO 24" Pulse compression dome radar, with industry-first 60 RPM operation. Built in VelocityTrack™ Doppler technology, simultaneous short and long-range coverage up to 48 nautical miles from one compact 24-inch dome antenna. 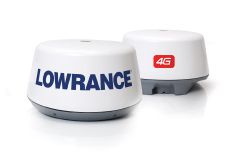 Lowrance HALO 24" Pulse compression dome radar, with industry-first 60 RPM operation. Built in VelocityTrack™ Doppler technology, simultaneous short and long-range coverage up to 48 nautical miles from one compact 24-inch dome antenna.